I shall be in Europe for the next few weeks, an area which is outside the scope of this blog. In my absence I though I would share with you some images of old Japanese picture postcards from my collection. These postcards were originally owned by a British Royal Navy captain who was seconded to Japan in the early 20th century to help develop and train the Imperial Japanese Navy. With hindsight he might have done too good a job! This postcard is one of a series of twelve, one for each month, portraying Japanese festivals and ceremonies from a hundred years ago. 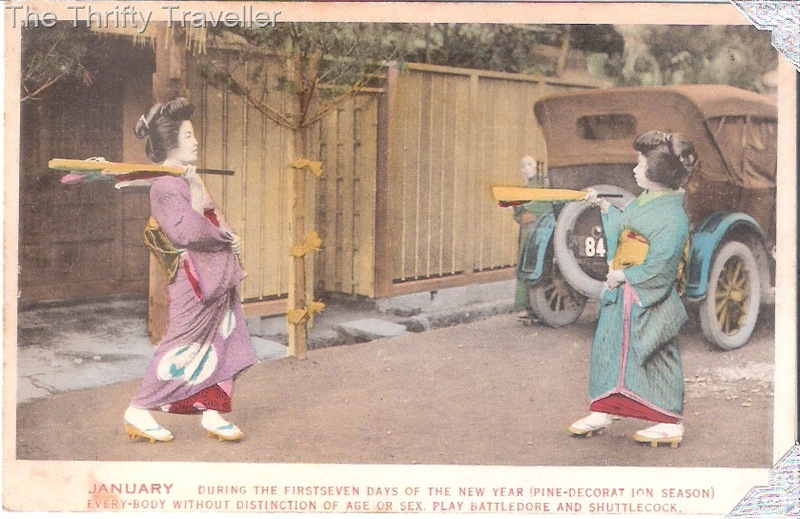 In case you cannot read the caption, it explains that these girls in traditional costume are playing the game of battledore and shuttlecock which is played during the first seven days of the New Year (pine decoration season). There is no date on the postcard but judging by the car, I would guess it dates from the 1920s. 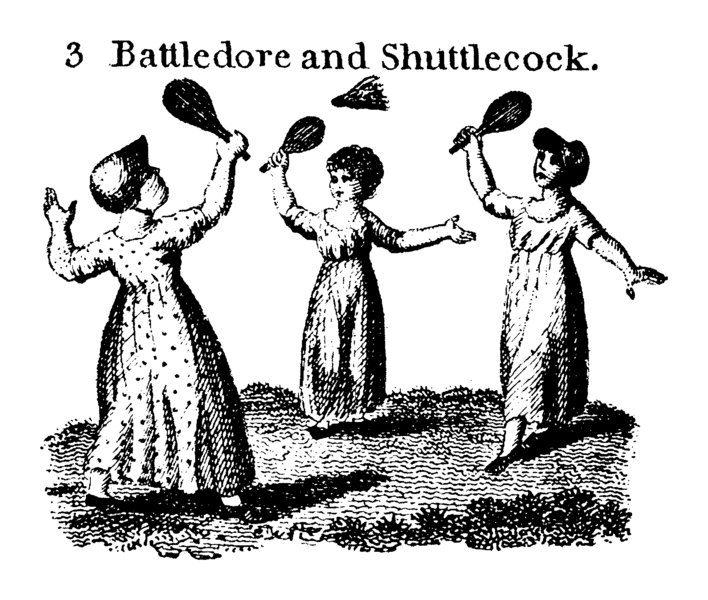 Battledore and shuttlecock is an ancient game which has largely been superseded by badminton in most countries. The object is to hit the shuttlecock to each other and prevent it from touching the ground for as long as possible. The record number of hits, achieved in 1830 in England, apparently stands at 2117. That does not sound unachievable and is a record waiting to be broken for anyone interested in getting a mention in the Guinness Book of Records. This game was introduced to Japan hundreds of years ago and is played with a wooden paddle called a hagoita and a shuttlecock made from a seed with feathers attached (hane). A battledore fair called Hagoita-Ichi is held from 17th –19th December annually at Senso-ji Temple, Asakusa, Tokyo during which wooden paddles are sold. Over the years these paddles have become more elaborate, usually padded rather than plain wood and bearing pictures of kabuki actors, girls in kimonos, TV personalities and comic book heroes. Nowadays the paddles are just for ornament or good luck charms and are no longer used to play the game. The Pine Decoration season refers to the practice of placing pairs of kadomatsu (traditional New Year decorations made from pine, bamboo and other plants) in front of homes to welcome ancestral spirits. After January 15th the kadomatsu are burned to appease and release the spirits them. The next post will be for February’s tradition.